Illustrations and text on inside covers Previous edition: published as by Carolyn McCarthy and seven others. 2013. 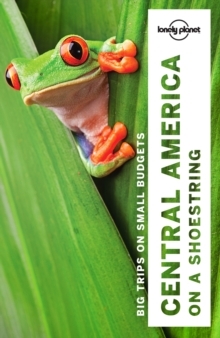 #1 best-selling guide to Central America * Lonely Planet Central America on a shoestring is your passport to the most relevant, up-to-date advice on what to see and skip, what hidden discoveries await you, and how to optimise your budget for an extended continental trip. Scale the Maya temples of Tikal, surf the smoothest and most uncrowded waves in Latin America, or explore the colonial charms of Granada; all with your trusted travel companion. Get to the heart of Central America and begin your journey now! Inside Lonely Planet Central America on a shoestring: Color maps and images throughout Highlights and itineraries help you tailor your trip to your personal needs and interests Insider tips to save time and money and get around like a local, avoiding crowds and trouble spots Essential info at your fingertips - hours of operation, phone numbers, websites, transit tips, prices Budget-oriented recommendations with honest reviews - eating, sleeping, sight-seeing, going out, shopping, hidden gems that most guidebooks miss Cultural insights give you a richer, more rewarding travel experience - history, music, cuisine, sports, wildlife, environment, architecture, literature, cinema, current events Over 90 maps Covers Mexico's YucatA!n & Chiapas, Guatemala, Belize, El Salvador, Honduras, Nicaragua, Costa Rica, Panama and more The Perfect Choice: Lonely Planet Central America on a shoestring is perfect for both exploring top sights and taking roads less traveled. Looking for just a few of the destinations included in this guide? Check out the relevant Lonely Planet destination guides, our most comprehensive guides that cover destinations' top sights and offbeat experiences. Check out Lonely Planet Latin American Phrasebook & Dictionary or Lonely Planet Latin American Fast Talk to make your trip go smoother and to get more cultural enrichment out of your travels. Authors: Written and researched by Lonely Planet. About Lonely Planet: Since 1973, Lonely Planet has become the world's leading travel media company with guidebooks to every destination, an award-winning website, mobile and digital travel products, and a dedicated traveler community.